Artists who make use of found materials are to be commended for their sustainable methods, but those who work with natural resources in situ, raise the concept of green art to a new stature. Surrounded by houses, a high-rise block of flats and the hospital on St Clare Street, Penzance's mysterious totem pole appears absurd. Yet, while it is seemingly besieged by the modern world, its spellbinding peculiarity and pagan symbolism has an unassailable strength. 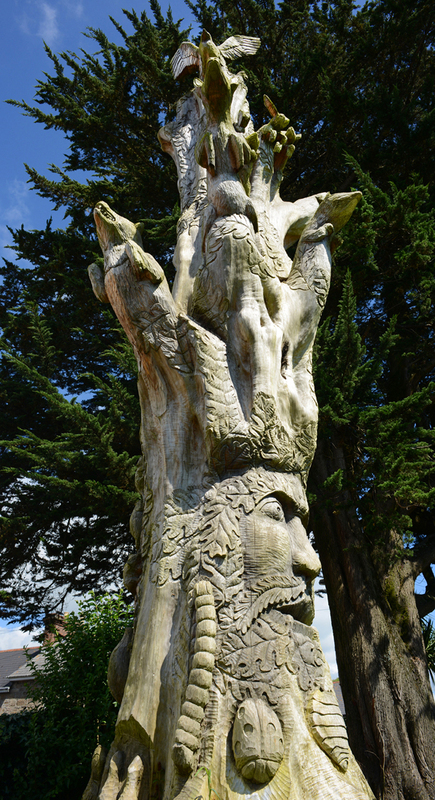 Skillfully carved from a lifeless tree, insects crawl around its trunk, branches metamorphose into wild dogs and rabbits, fossilised in mid-leap, and the fearsome green man stands sentinel at the foot. With no plaque or signature to be found, we're left wondering about its maker, their inspiration and their message. Nevertheless, it's a formidable reminder of our primitive origins, as well as our remote and rustic setting. And, to our minds, the resonating idea is that fresh purpose and lasting beauty can be created from the decay of life. Hi Guys - this link may be of interest! We knew someone would know. So, for the record, the sculptor was Peter Martin.